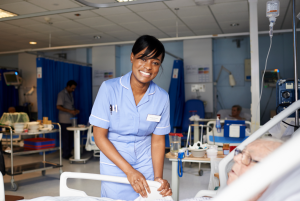 Meet our Croydon nurses » #ChooseCroydon » Could you be a Croydon Nurse? “I started at Croydon Health Services as a student nurse, now I’m a specialist nurse in the Cardiac Care team. I’ve worked hard to get where I am today and the Trust have supported my progress all the way. They have encouraged my desire to succeed all the way. “Being a nurse isn’t easy but that’s why I love it. And I love Croydon because it brings me a new challenge every day. “I’m a community nurse and work with schools, young people and their families across the Croydon. I support them through their school journey and help them with different health issues that they may face, it’s such a varied and rewarding role. 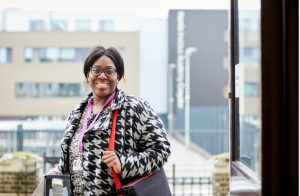 “Working for Croydon gives you flexibility – it’s an integrated Trust so you can work in the community like me, then if you wanted to move into the hospital the Trust will support you to make the change. “For me it’s all about feeling valued in the place I work. We spend a large part of our lives at work, away from our families and friends so you’ve got to love your job. And I love being a midwife at Croydon Health Services. “I work with a really great, award winning home birth / maternity team and we are always striving do the best for the women we care for in their homes, and in our clinics, children’s centres and hospital – we are able to form a fantastic bond with all of them. “I’ve just started at Croydon University Hospital, in the Acute Medical Unit, after seven years working in a Surrey hospital. “I chose to come here because of its diverse mix of people and fantastic team ethos. I’ve already met people from all walks of life and can tell it’s a great place to be.